How are multiple sclerosis (MS) and dementia related? 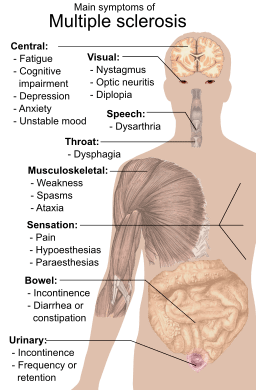 Cognitive Function – according to the Multiple Sclerosis Resource Center, UK, about 50% of people with MS say they experience cognitive problems to some extent, increasing to 80% among the most severe cases. The most commonly reported cognitive abnormalities include problems with memory, abstraction, attention and word finding. Alzheimer Europe has some good information on MS and symptoms of dementia. You can access their page by clicking on the title, below. Also read “Facing the Cognitive Challenges of Multiple Sclerosis,” 2nd Edition for a view inside the mental twister of living with cognitive MS symptoms. Thank you for the additional information, Jeffrey!